Who else is tired of Thanksgiving food?! Despite having company this weekend we were still left with plenty of leftovers to last through the weekend. I was happy to indulge on pie and mac & cheese, but was otherwise over it after a couple days. 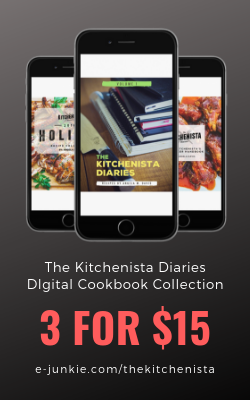 That's the downside of preparing for big holidays ahead of time as a food blogger...we get a little worn out by the time the actual day comes around. 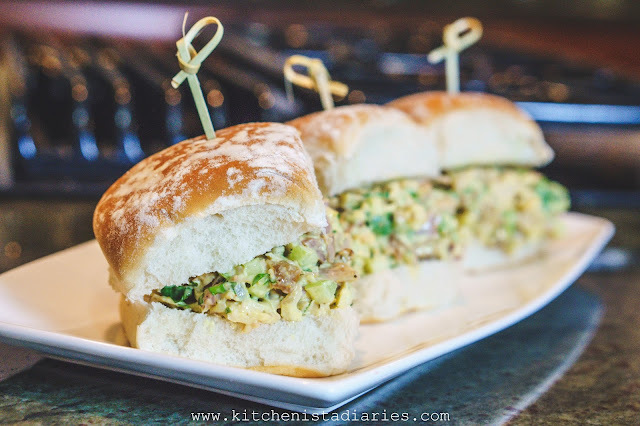 My obligatory Thanksgiving leftover sandwich this year was a curry turkey salad with homemade scotch bonnet mayo. 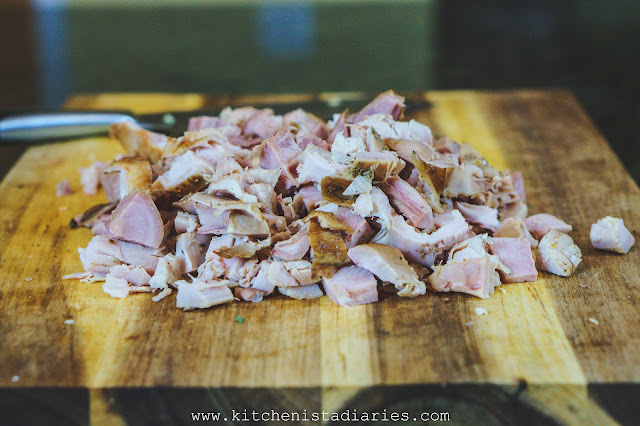 Simple, but effectively invigorated my taste buds and got me thinking outside of the box for the last bit of turkey that was left! 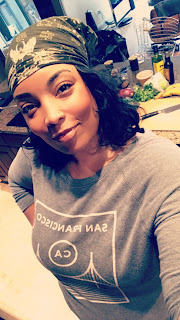 One of my Instagram followers relayed that her family makes curry turkey for Thanksgiving, which I thought was genius and it's been on my mind ever since. 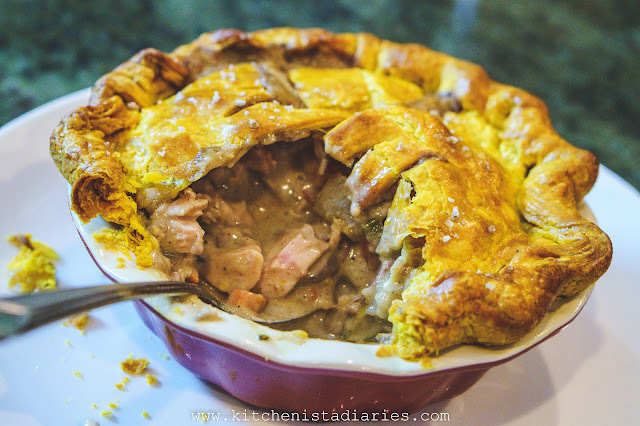 I decided I'd go with the inspiration and put a Jamaican spin on classic turkey pot pies. Allspice, cinnamon, nutmeg and ginger easily work into the holiday profile, with garlic, thyme and scallions adding the proper savory balance. 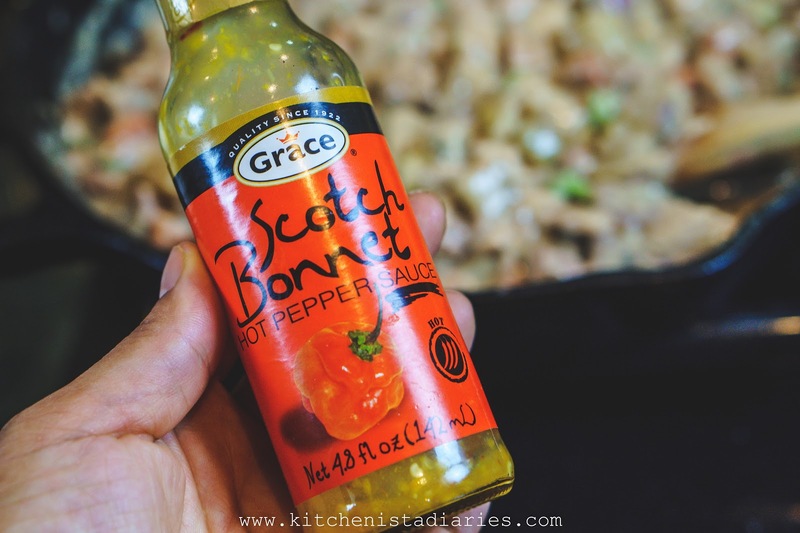 I used red chile flakes and scotch bonnet pepper sauce for the familiar heat of jerk chicken. 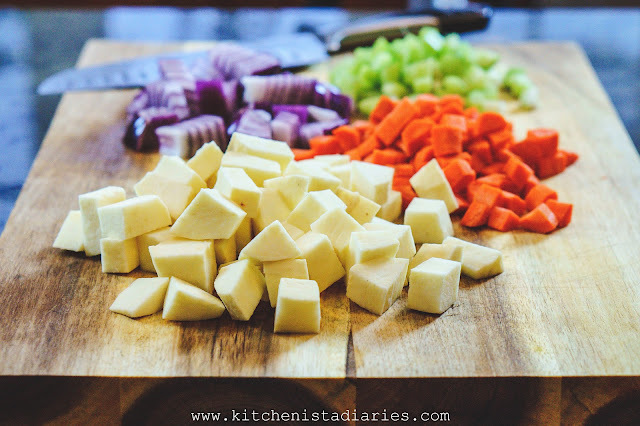 Classic pot pies usually include the mirepoix of onions, carrots and celery to build the sauce, as well as white potatoes. I didn't have any regular potatoes on hand, but I did have a white sweet potato. 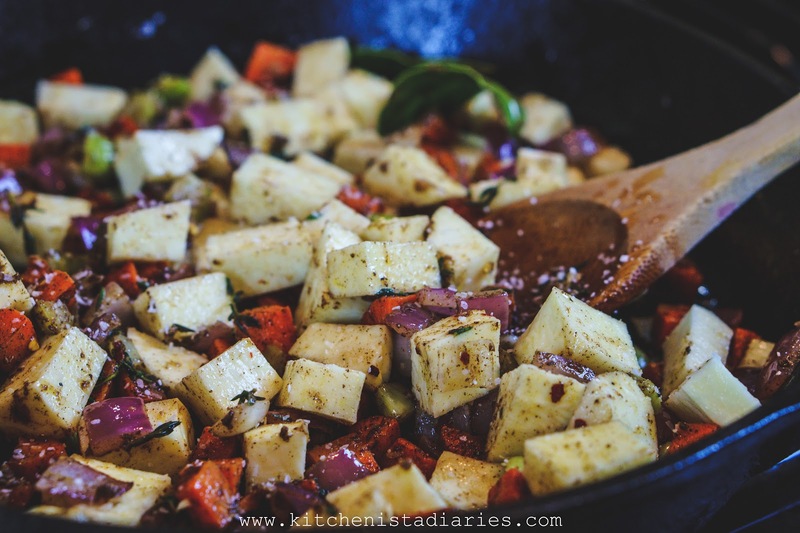 It actually worked well to add some sweetness into the mix while retaining the starchy familiarity of white potatoes. Homemade turkey stock and heavy cream formed my sauce, which after simmering tasted like a creamy jerk spiced gravy. 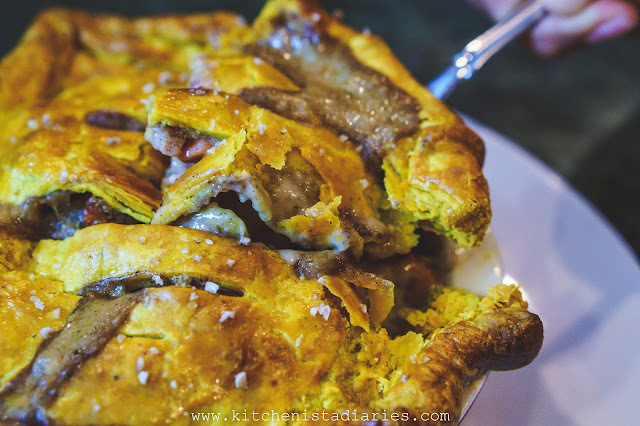 As soon the pies baked and I cracked into this golden flaky crust, I knew that this recipe had to be written. In a mad rush of creative energy, I also decided to make my first attempt at adding some video content for the blog! So many of you have been asking, so thank you for pushing me. 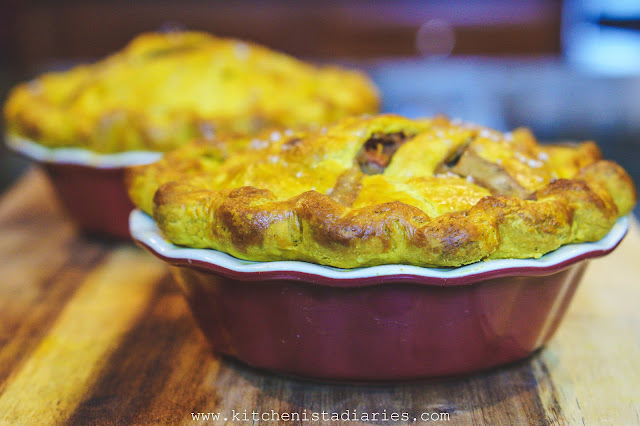 Pie crusts seem to be a thing that cause a lot of anxiety for home cooks so I figured this would be a good one to document in an up close and personal video tutorial. I hope it helps you get a better glimpse of my process as described in the original pie crust recipe. I'd also love your feedback as I get started on creating future videos! 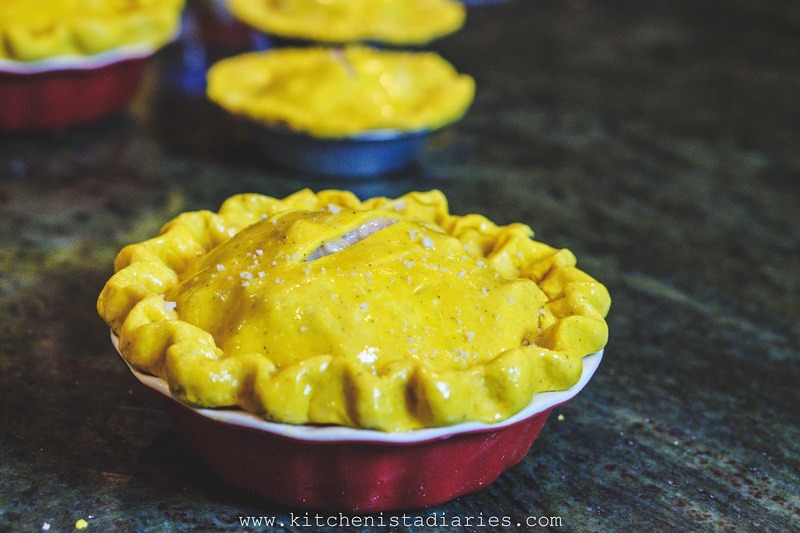 Notes on the pie crust: To make a curry flavored crust, add 2 tbsp Jamaican style curry powder and 1 tsp black pepper to the flour in your favorite homemade pie crust recipe. The filling makes enough to fill a deep dish pie, or you can split it into several mini pie pans as I did. As indicated in the note above, all you need to change in your typical pie crust recipe is the addition of curry powder and black pepper. 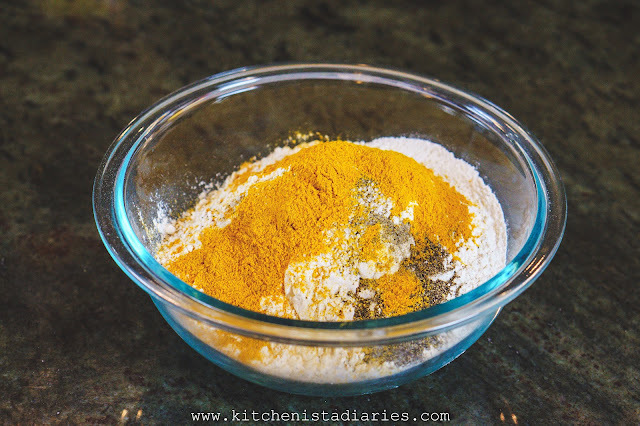 The turmeric in the curry powder blend will make the dough a gorgeous bright yellow color! If you're following my recipe, be sure to chill the dough for an hour before working with it, or do this part the day before you plan to use it. 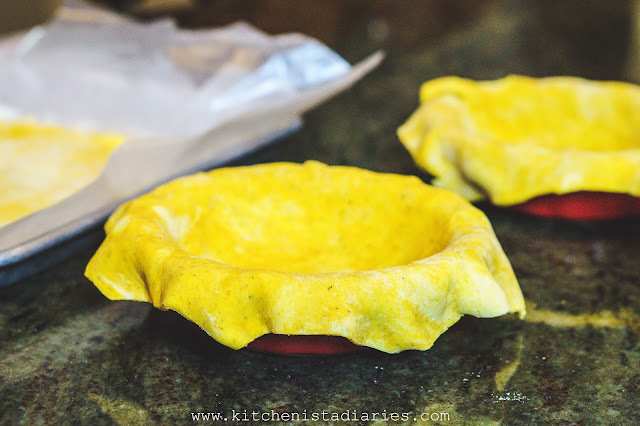 After rolling out your dough and fitting the desired pie pan(s), chill the shells until needed. 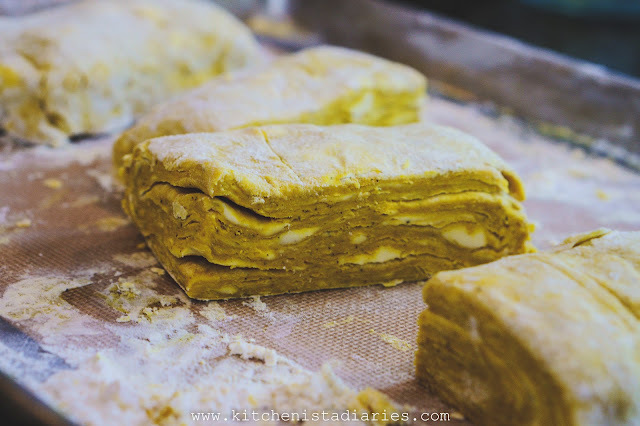 The top crusts can be rolled out ahead of time and layered between parchment or wax paper. 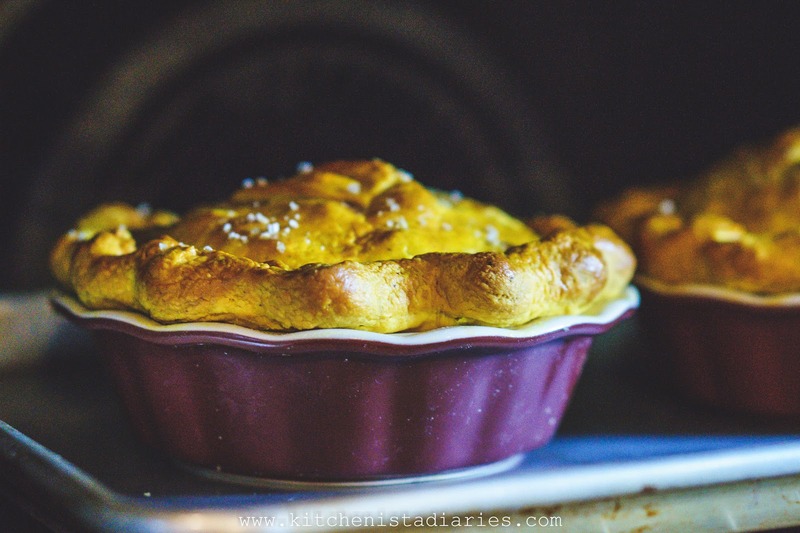 You can use this recipe to make one deep dish sized pot pie. I like to have smaller pies to freeze for later, so I did several mini pies. I was able to fit two 5" deep dish pie pans and two 2" mini pie pans with my standard pie dough recipe. 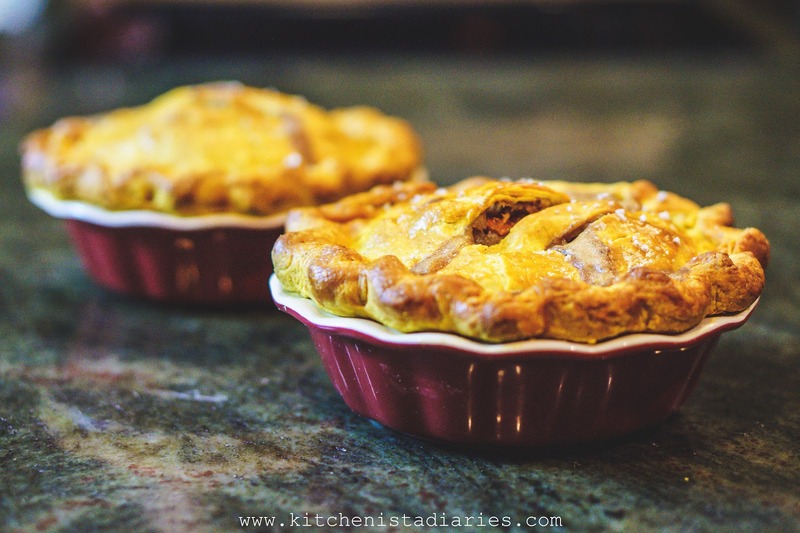 If you're new to making mini pies, it takes a bit of guestimating to figure out how to portion the dough evenly, but with time you'll become familiar with what works for the size pie pans you have. 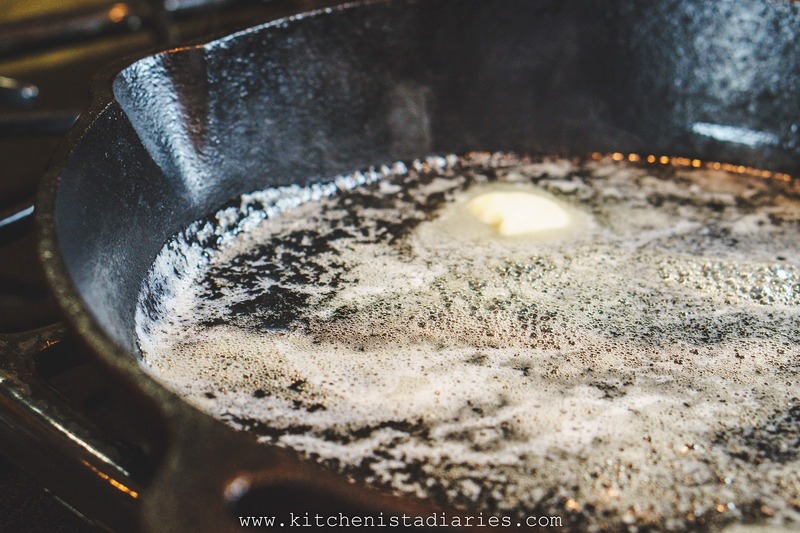 To make the filling, melt two tablespoons of butter in your skillet over medium heat. 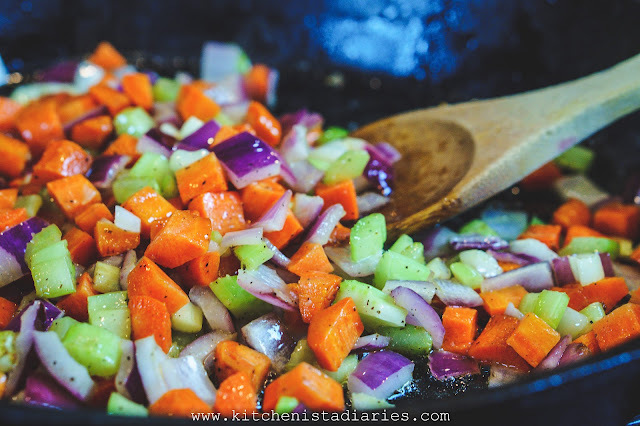 Add the onions, celery and carrots. Cook for a few minutes until the vegetables soften, seasoning with salt and pepper. 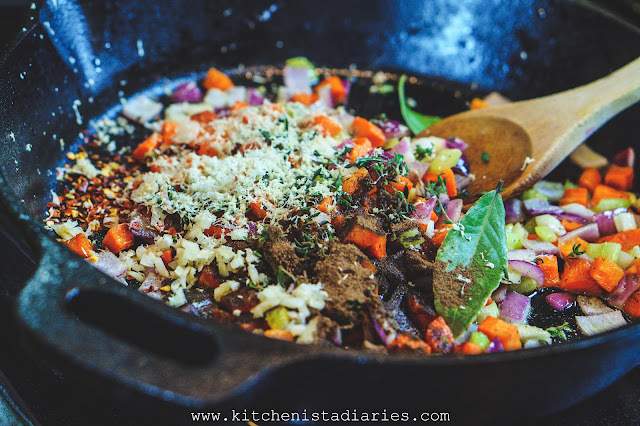 Add the garlic, ginger, allspice, cinnamon, nutmeg, thyme, pepper flakes and bay leaves. Cook for a minute until fragrant. Stir in the cubed white sweet potatoes. Season with salt and pepper, turn up the heat and bring the stock to a boil. 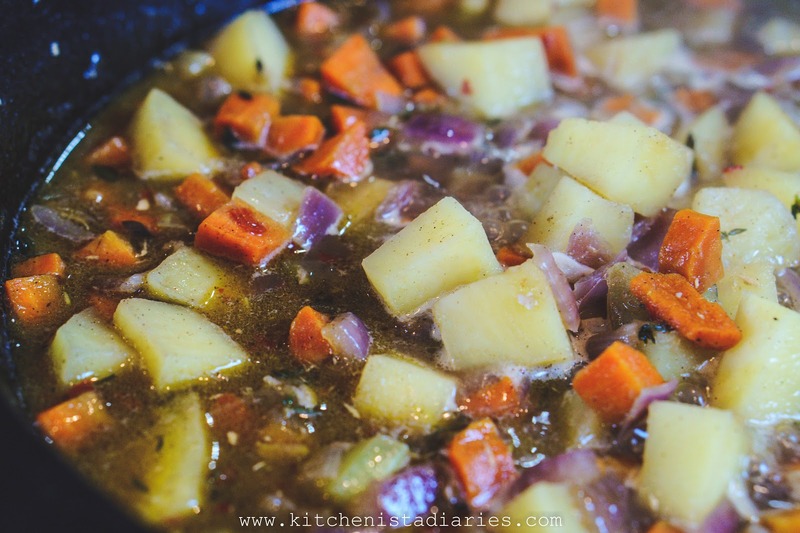 Reduce heat and simmer until potatoes are just beginning to turn tender, about 10 minutes. Remove the bay leaves. Whisk the heavy cream, cornstarch and flour together until dissolved. 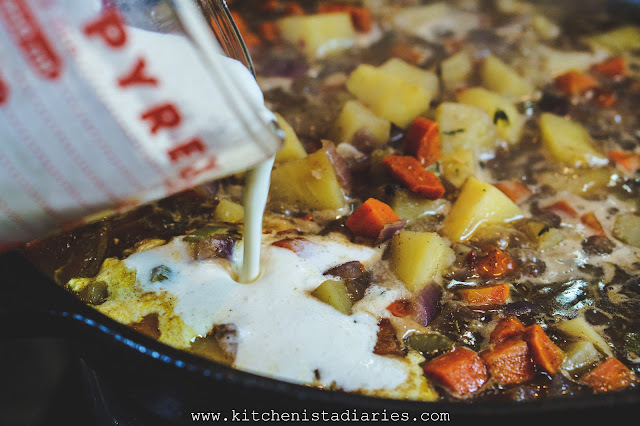 Pour it into the skillet and stir to distribute. 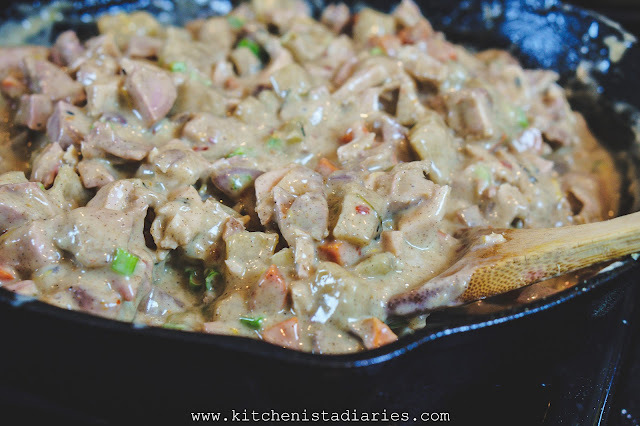 Turn up the heat to medium and simmer for a few minutes until the gravy thickens. 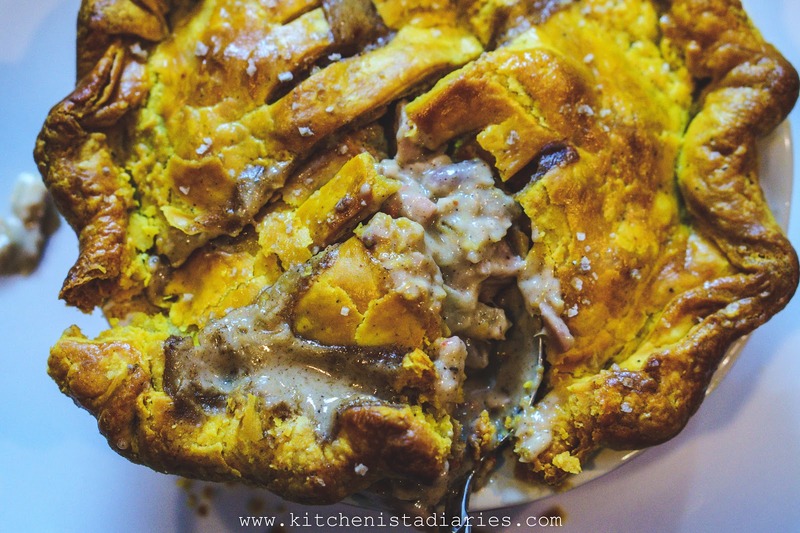 It should be pretty thick; probably thicker than you think you'd want but it thins out a bit once cooked inside the pie crust. If you do want to add more liquid, heavy cream is a better choice as it's already thick. Stir in the diced turkey, lemon zest and scallions, and season to taste with salt and pepper if needed. If you like it spicy (and this pot pie is crying for it) you've gotta add the scotch bonnet pepper sauce for the authentic flavor! Otherwise, use your hot sauce of choice. 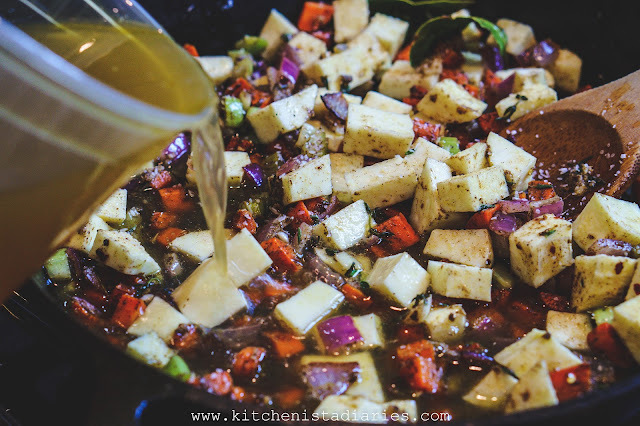 Let the pot pie filling cool completely before using. In that time I rolled out and chilled the pie crusts as shown in the earlier photos. When ready to assemble, preheat the oven to 425° F.
Make your egg wash by beating together an egg and a couple teaspoons of water until frothy. 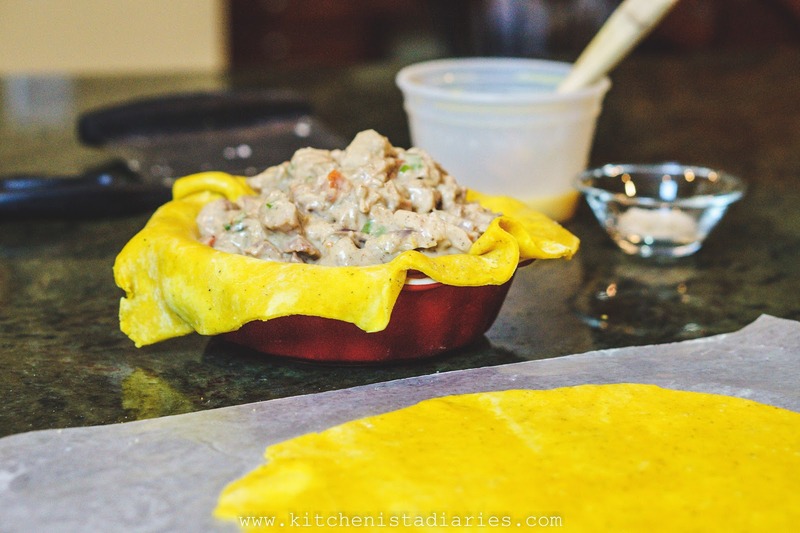 Brush the rim and insides of the bottom pie crust(s) and spoon in the pot pie filling. You want it heaping over the top as it will cook down some once baked. Cut a few slits in the center of the top pie crust to vent, and place it over the top. Seal the edges and trim any overhang of more than an inch. Then you can tuck in the edges and crimp or flute the crust decoratively as desired. Brush with egg wash and finish with a sprinkling of sea salt. Bake at 425°F for 20 minutes to set the crusts, then turn the heat down to 375°F and bake until the filling is bubbly and crusts are a deep golden brown! Allow to cool for fifteen minutes before diving in, this helps the gravy thicken back up! But totally worth the wait (and work!) This is a recipe we definitely won't be waiting around for Thanksgiving to make again. Enjoy!